Well done, and terribly sad. "Thank you for your service," indeed. The way we treat veterans upon their return home is shameful. From the VA to physical rehabilitation and psychiatric services to gainful employment and reintegration into society. We can do better. Way, way better. There is a tidal wave, literally tens of thousands of soldiers returning home to...a mess. Or, worse, to nothing. Just...silence. Abandonment. Unemployment. Broken families. Mental health issues. PTSD. Sleeping in cars, living on the streets and under bridges. 22 suicides per day...one every 65 minutes. Limited services, with months and months of waiting. Precious months and zero sense of urgency. 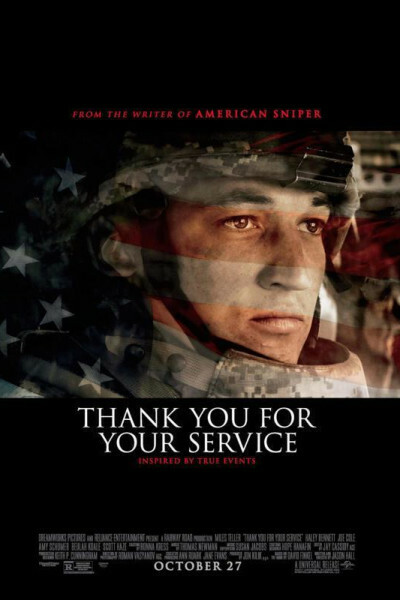 Thank You for Your Service is a true story, following the lives of three particular vets after their return home following second and third deployments, and it leaves you wanting more, for them, and for everyone touched by war and violence. See it, not because it's enjoyable, but because it's honoring and humbling and infuriating, as it should be.